Indianapolis, IN (February 2016) Great news, GreenLight products are available at Ron Jon Surf Shop! Ron Jon is the “World’s Most Famous Surf Shop" with its flagship store conveniently located in Cocoa Beach, Florida. 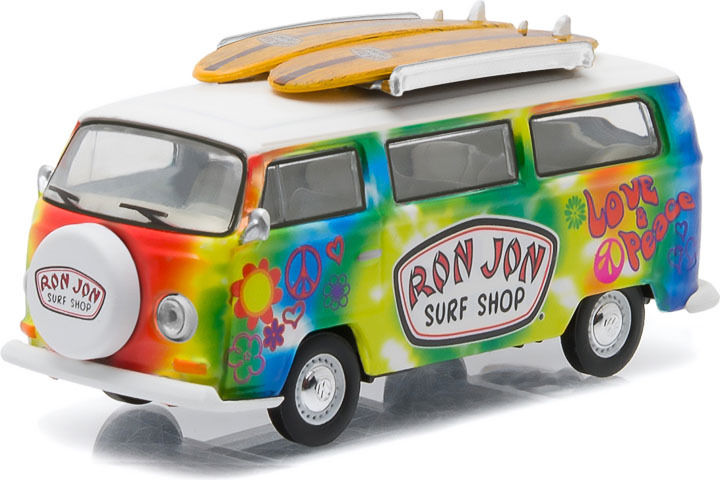 The Ron Jon name is synonymous with fun, so it’s no surprise they created a custom 1:64 scale 1969 Volkswagen Type 2 Bus complete with two surf boards stowed on the roof. When you think of the perfect surf mobile, the classic VW Bus is the first thing that comes to mind! 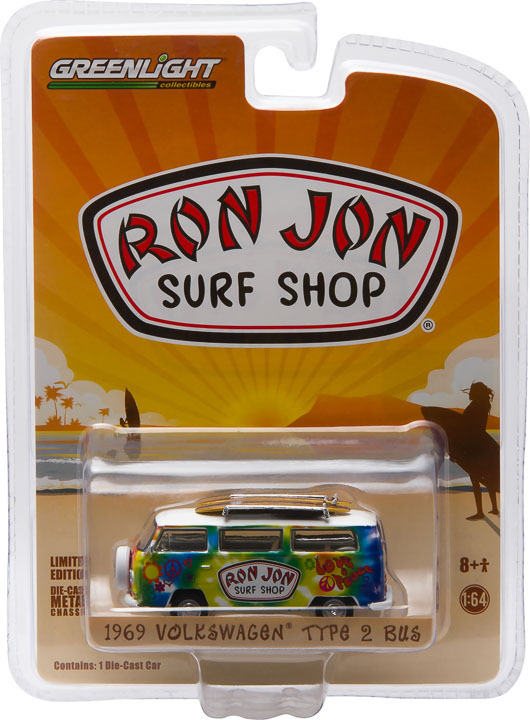 Ron Jon recently began selling GreenLight die-cast dioramas at select stores along the east coast of the United States. 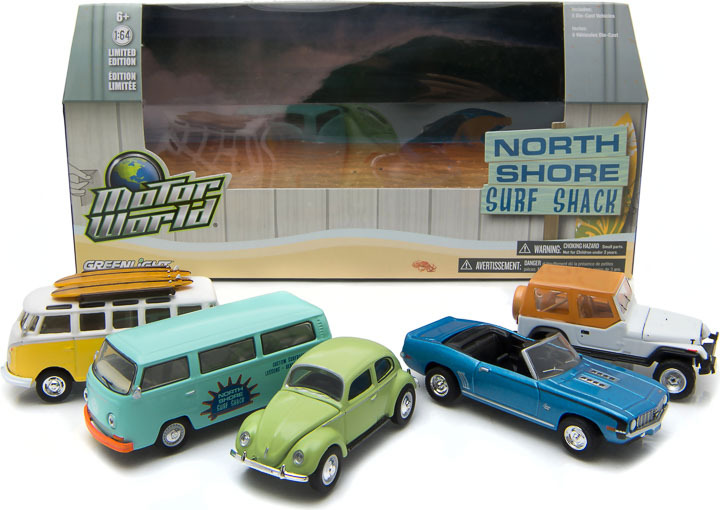 The first available is the Motor World North Shore Surf Shack diorama featuring 1:64 scales of a 1952 Split Window VW Beetle, a 1969 Chevrolet Camaro SS, a Custom 1968 VW Surf Shack Bus, a 1987 Jeep Wrangler YJ and a VW Samba Bus with stowed surf boards. This new GreenLight account will surely prove beneficial and might even see further development of exclusive vehicles. Keep an eye out on social media for any additional details and announcements regarding GreenLight products at Ron Jon Surf Shop! Ron Jon Surf Shop was founded in 1959 by surfing enthusiast Ron DiMenna. Two years later, he opened a tiny oceanside shop in Long Beach Island, N.J. The lifestyle-apparel and board-sports-equipment retailer has since opened stores in Cocoa Beach, Ft. Lauderdale, Orlando, Ft. Myers, Key West, Panama City Beach, Clearwater Beach, Fla., as well as Myrtle Beach, S.C., Ocean City, Md., and Orange Beach, Ala. The flagship store in Cocoa Beach is the world's largest surf shop. It operates 24 hours a day, 365 days a year. On the web: www.ronjonsurfshop.com.